We are little more than ten minutes into our conversation when Vogue Williams announces that she’s taking her leather trousers off. They are just ‘so incredibly itchy’, she explains, as she dashes behind a screen to change into another pair. But back in her chair opposite me, now sporting a sleek pair of posh joggers, she remains in constant motion – shifting positions, fiddling with her great mane of wavy blonde hair and munching popcorn as she chats 19 to the dozen. It’s this boundless energy – as well as her charisma and disarming lack of airs or graces – that is helping to catapult Vogue into the spotlight. If you aren’t yet familiar with the statuesque 31-year-old model, TV presenter, radio host, columnist and DJ, you very soon will be. She’s already a household name in Ireland where, as part of her thoroughly modern portfolio career, she presents a documentary series for the national broadcaster RTE, Vogue Williams Investigates (available in the UK on digital channel Quest Red), and her star has been in the ascendant in Britain since winning the reality series Bear Grylls: Mission Survive in 2015, beating fellow contestants including Olympian Kelly Holmes and rugby champion Mike Tindall. The show involved spending 12 days in the Costa Rican jungle, employing survival techniques that were not for the meek. ‘I’m a bit of a tomboy and I love a challenge,’ she enthuses. She’s also recently become prime paparazzi fodder, thanks to her relationship with fellow reality TV star Spencer Matthews, 28, whom, when we meet, she has been dating for seven months. The Eton-educated former broker was painted as the womanising love-rat of Made In Chelsea, a public image he has yet to shake off. But more of Spencer later. We’re here today, in a studio in Southwest London, to discuss the latest string to Vogue’s well-furnished bow: her book, Everything: Beauty. Style. Fitness. Life, which is a mix of tips, personal stories and anecdotes. Among the ‘life hacks’ (millennial-speak for time-saving and organisational tips), Vogue also writes at length about her anxiety, and learning to combat it. It’s hard to imagine the young woman in front of me – bubbly, apparently confident and unfeasibly attractive – ever struggling with anxiety, but it’s something Vogue has battled for the past decade. ‘You do feel like a bit of a weirdo because it’s not something that’s tangible – you can’t see it and it’s often hard to explain to people, even my mum,’ she says. Part of her aim with the book, therefore, is to help further understanding of the condition. ‘There is a stigma attached to anxiety, and to mental health issues in general,’ she says. I mention the work being done by Princes William and Harry, and the Duchess of Cambridge (to whom Vogue became linked when Spencer’s elder brother, James, married Pippa Middleton in May) and their mental health charity, Heads Together. ‘To have people like them, in their position, talking about this really helps it to hit home for so many people,’ she says. Her father, Freddie, and mother, Sandra, divorced when Vogue was seven, a split that she says was ‘not amicable’. Sandra worked as both an air hostess and a waitress to support the family before remarrying, when Vogue was eight, to Neil, a businessman and property developer, and moving the family to Howth, a wealthy suburb of Dublin that Vogue calls her ‘favourite place in the world’. Though Neil and Sandra have lived in Spain for over a decade, the majority of Vogue’s family is still in Dublin, and is close-knit. She owns a flat there, where her sister lives full time, and where she stays when working in the city. Their aunt lives above them. But family relations weren’t always so harmonious. She refers in the book’s dedication to her teenage ‘monster years’, which began around the age of 14. Suspended from school, and after a big fight with her mother and Neil, Vogue was sent to live with her father for a year. ‘He was way less strict,’ she laughs. At 16, she began modelling. So is she, I ask, someone who always feels confident about her looks? ‘No! I don’t think any woman is,’ she cries. ‘I’m certainly not in the shape I’d want to be in right now.’ (For the record, she looks incredible.) Though a fitness devotee, ordinarily working out six days a week, earlier this year she injured the anterior cruciate ligament in her knee while training for the Channel 4 ski challenge show The Jump before it aired in February. Before she could launch herself on the building sites of Dublin, however, reality television came calling. In 2010 she was cast in Fade Street, an Irish TV show in the vein of MTV’s The Hills, which, she says, was ‘a total gas’. Then, in May 2011, she met Brian McFadden, former member of Irish boy band Westlife and the ex-husband of former Atomic Kitten Kerry Katona. It was a whirlwind romance; within months she had moved to Australia, where he was a judge on Australia’s Got Talent, and in September 2012 they married in a lavish ceremony in Florence. She writes in her book that although it was an impulsive decision, she has ‘never regretted it’. Looking back, she also believes she was partly running away from a painful situation at home in Ireland – her father had just died after a stroke. In 2014, the couple returned to the UK, splitting their time between London and Dublin, but separated shortly afterwards. ‘I don’t want to say too much about the break-up of my marriage because it’s in the past,’ she writes. The separation was initially amicable, but today, leading different lives, they are ‘no longer friends’, she acknowledges in the book. Of her newfound single status, Vogue recalls: ‘I thought, “This is absolutely brilliant, I can do whatever I want.” I threw myself into my work. I loved the independence and I loved being on my own, which is not something I imagined I’d ever say,’ she admits. And then she joined The Jump. From the start, Vogue and fellow contestant Spencer (who went on to win the show) hit it off, first in London and then at the show’s training camp in Austria. ‘You’re thrown into a situation where you’re living together for six weeks, and it was about a month into it that we both thought, “Oh, maybe this could actually go somewhere.”’ It seems they were bang on. 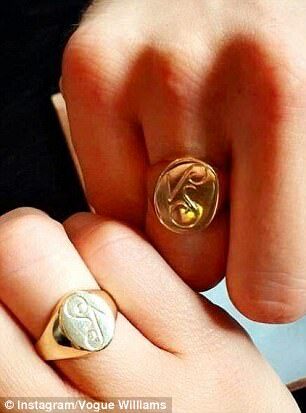 The day before we meet, Vogue posts an Instagram shot of the matching signet rings she’s had made for Spencer’s birthday, inscribed with an interlinked V and S. In her own words, they are ‘sweet and cringey’. So, I venture, is he The One? One wedding she won’t comment on, however, is Pippa’s. The bride was rumoured to have imposed a rule of ‘no ring, no bring’, meaning that Vogue was not invited as Spencer’s plus one, even though he was one of the best men, because the pair aren’t married or engaged. But Vogue remains utterly discreet. ‘They’re quite private and they don’t want to be the topic of conversation, so I steer clear of it – I don’t say anything about it at all,’ she says of Spencer’s brother and new sister-in-law. She’s happy to be vocal about the rest of the Matthews clan, however.